A change to Apple's iOS developer policies started rolling out on Friday, with the company now allowing up to 200 test devices per user account. The change, news of which first circulated on Twitter, doubles the number of devices a developer can have active when testing their app. Not all accounts are showing the new feature, and Apple has yet to officially confirm the program's expansion. 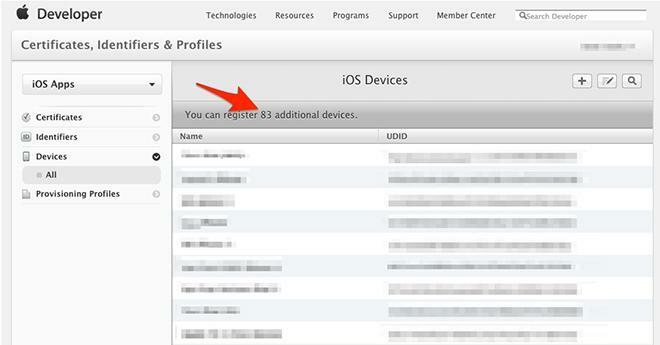 Apple's rules as seen on its developer website still note only 100 unique devices may be deployed for testing per account, per year. To keep track of a developer's device count, the company records the unique device identifiers, or UDIDs, for each deployed unit. If a device is removed from testing mid-year, it counts against the total tally. Because developers need to test their apps on multiple iPhone, iPad and iPod versions, the 100 device limit may become restrictive if units are broken or rendered unusable. It is not currently known when Apple plans to complete the rollout, but developers can check their individual account status by visiting the online Developer Center.